On Sept 30th, the Blue Jays clinched the divisional title in the first game of a double-header. There were many shots, in the last few minutes of the first game, of players in the dugout waiting to celebrate. One of them was wearing what appeared to be a toque or brimless cap. It was blue and had a Blue Jays logo on it. Later, he was celebrating on the field with a GoPro over this hat. 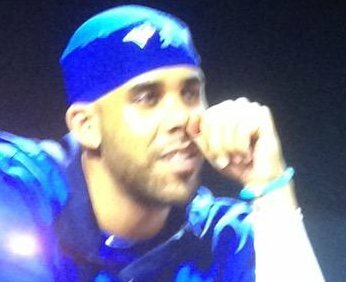 A little twitter research reveals that it was David Price, and that he had the hat custom made. I would have imagined that brims were not optional. Are there rules about caps and hats? Do they perhaps only apply while a player is on the field? While there are no specific rules in MLB OBR about caps and hats, rule 3.03 (a) requires all players to wear the same kind of uniforms. This includes the same style of cap, as well. 3.03 (c) No player whose uniform does not conform to that of his teammates shall be permitted to participate in a game. Who is considered to be a player? What is considered to be participating in game? Why was he allowed to be in the dugout in that case? BENCH OR DUGOUT is the seating facilities reserved for players, substitutes and other team members in uniform when they are not actively engaged on the playing field. In this instance he should be considered an other team member and this definition hints, that all team members should wear the same kind of uniform, as explicitly required for players in rule 3.03 (a). 8.01 (c) Each umpire has authority to rule on any point not specifically covered in these rules. * On September, 30, when the Blue Jays won their division, they played two games. David didn't appear on any of the two lineup cards (Game 1, Game 2), so he was not eligible to come into the game. In this case it is fair to assume, that he didn't count as a player. Not the answer you're looking for? Browse other questions tagged baseball equipment or ask your own question.